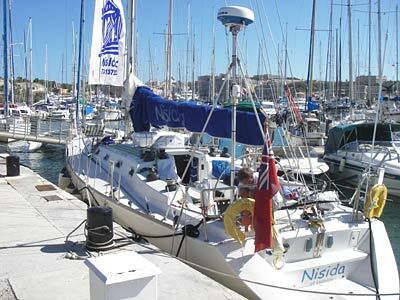 Our 52ft yacht Nisida left Malta and the Middle Sea Race bound for Gran Canaria and the ARC on 1st November 2006. On board were seven LCSC members; Peter Hopps (skipper), myself, Jeremy Whiting, Rhys Triffit, Becky Senior, Peter Law and John Bowron. For all of us except the skipper this was the longest trip we had undertaken (and indeed for Peter Law it was to be his first night sail). We'd allowed 14 days for the 1700 mile trip, allowing time for a refuelling stop if required in Gibraltar but provisioning for the full two weeks. 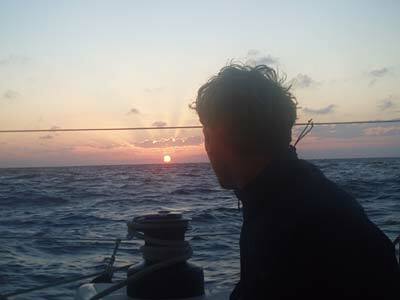 To complete the whole distance, non-stop, in just over 9 days was testimony to mostly favourable (if breezy) winds, a boat which loves downwind sailing at speed and, most of all, to a fabulous crew who more than rose to the occasion. I'd never imagined a delivery could be quite such good fun. We left Malta on Wednesday after a quiet little drink on Tuesday to celebrate Hilary's birthday. Heads soon cleared as we turned north west out of the harbour into 20 knots over the deck, and on the nose, which rose to over 30 knots overnight and continued the next day. Luckily for morale and prospective progress the forecast was for the wind to swing into the north east by late that night and it duly did. Since then we have been running with the main with up to two reefs and the yankee poled out and have hit speeds of up to 14.5 knots. Our daily run rate has shot up from not much more than 120 miles to over 200 today and we are now north east of Algiers and 550 miles from Gibralter. We haven't yet decided whether to stop there (not Algiers) or anywhere else and while sailing is like this it would seem a shame to stop. Today we passed the half way mark on our trip - hitting 800 miles gone and to go at watch change at 8am this morning (from when we covered 40 miles in 4 hours). We've now covered over 600 miles as the crow flies in the past three days and have 100 miles to go the entrance to the Gibraltar strait. Daytime has typically seen the wind dropping to around 20 knots and yesterday we introduced two of our crew to the spinnaker for the first time. Today it's been back up to touching a force 7 but is now dropping away and we're watching a school of dolphins playing awaiting Jeremy cooking our dinner. Tonight sees the last of our fresh meat - spag bol - and then we're onto devising menus for freeze dried chicken and testing our ARC food. It's 700 miles now to Gran Canaria and we aim to be there in time for the first of the ARC parties next week. By then we'll all be very ready for a shower and a beer. Yesterday we passed through the Strait of Gibraltar - an event we were awaiting with great excitement (we hadn't seen much land, or anything else apart from dolphins, for 5 days). Just ahead of dawn we could see the lights of both Africa and Europe and make out the outline of the Rock. However there was to be no sunrise to match those of the previous days - the cloud came down to near sea level, the heavens opened and, rain temperature apart, we might have been in Scotland. The Atlantic weather itself proved very different from the Med, and rather familiar, ie a low pressure system with driving rain, gusting winds and limited visibility. Yesterday it was almost chilly but today you can tell we are now further south than most of us have ever sailed. The sun is hot and we are drying out the boat as we sail out west towards where our forecast tells us we may find more wind. The other change we encountered on leaving the Med was to the distance of our voyage. 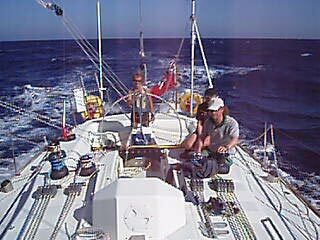 It is 1020 nautical miles to Gibraltar, and when, as we passed there, we moved our GPS waypoint to Gran Canaria it showed a further 698 miles to go. 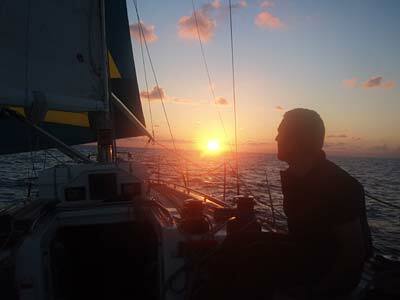 So a total distance of over 1700 miles and not 'about' 1600 as the skipper had led us to believe. But if we could average 7 knots from here in (and 25 knots of wind are forecast from the south east for Friday) we could still beat 10 days for the trip, and be in a bar in Las Palmas bragging accordingly on Saturday night. The wind is now picking up and with luck we will be spinnakering by the time the other watch comes up on deck. It's also Peter (Law's) birthday but we haven't yet decided how to celebrate - we'll wait and see what the weather is to bring us. 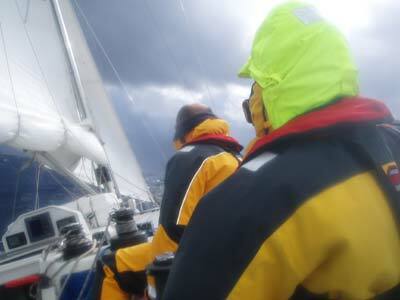 We are now 150 miles south west of Casablanca and have just taken down the spinnaker. In our quest to keep our daily run rate up above our 7 knot target, and with the wind down to only 15 knots, we held it overnight last night for the first time this trip. In terms of run rates (and apologies for our obsession with these, but there isnt a lot else to get excited about out here) we ran 148 miles in the 16 hours from midnight when we gybed on a favourable wind shift. But in contrast to the similar run rates achieved in the Med when we hurtled down Alp-like mountains of waves, out here we have mere rolling foothills - less exciting for the helmsman but much more comfortable on board. We are now about 315 miles from Gran Canaria and conversations are turning to how we will cope with dry land. The forecast tomorrow is for force 6 to 7 from the south east - which should produce a fast if bouncy run in - but we may well try and slow down in order not to arrive at a tricky harbour in the dark of Saturday morning. Life on board has got noticeably more sociable as we don't simply come off watch and head straight for our bunks, hoping for some sleep before we crash off the next wave. 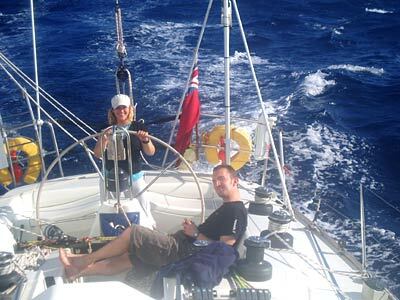 The rest of the crew are all now on deck, enjoying the late afternoon sun and over 8 knots on the clock. Time now to go and prepare the next freeze dried chicken dinner. Last night the skipper starred with chicken korma, tonight it will be chicken paprika. Recipes available on request. Malta - Gran Canaria part of this delivery trip.